If heat could speak, then it’s shouting right now. It’s so hot outside, the candles have melted on the terrace, the dog hasn’t moved since yesterday, and we have blankets pinned down over our skylights to keep out the sun. In this heat, food must be easy, cool and light. Preparation should be kept to a minimum, and any heat generating appliances forbidden. In our home, this means it’s time for Gazpacho. When I make gazpacho, we know that summer has arrived. We are dining al fresco, and the temperature is approaching triple digits. It’s a hot weather dinner staple that’s followed us from country to country, always called upon when we are in the midst of a heatwave. This gazpacho is chunky, and we affectionately call it a liquid salad. Not a fan of mushy consistencies, I dice all of the vegetables and float them in seasoned tomato juice. The result is a cool soup with loads of crunch and texture, satisfying and refreshing to eat. And in this heat, crunching our soup is the most exertion we can manage. Serve with cheese and bread, melon and prosciutto and a chilled rosé or sauvignon blanc. Serves 6-8. Combine all of the ingredients, except the cilantro in a large bowl. Mix together and taste for seasoning. Refrigerate at least one hour or up to 6 hours. Before serving, stir in the cilantro. Serve ganished with sliced green parts of the spring onions, sliced jalapeños, additional cilantro and lime wedges. Definitely a new Arizona summer recipe. The colors are fantastic and I’ll be able to use those tomatoes that are quickly ripening in our garden! Thanks, Lynda! You can send some of the heat this way – I’ll take it. 🙂 This gaspacho looks awesome and yes – I can definitely imagine it goes well with a sauvignon blanc. These photos are fantastic! Another San Diego fan here…I like the idea of making gazpacho have a chunky texture and plan to revise mine. I love how you keep it chunky. Very cool, ha, pun intended, recipe! Lynda, I love gazpacho , too. Your vibrant colors look delicious! Your pic is gorgeous! The description of “liquid salad” is perfect…I think that is also how Hemingway described it. That gazpacho even LOOKS cool and refreshing. Great way to beat the heat. Love gazpacho! And yes, it is the perfect al fresco dish on a warm summer evening. 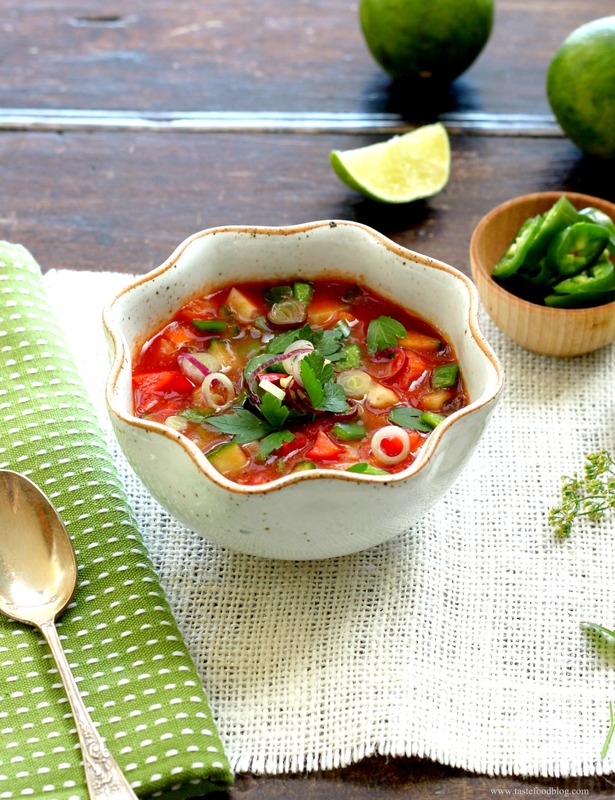 Your gazpacho looks so fresh and cool! One of the must-have in summer. I made this last night and my guests all LOVED it! Instead of cucumber I threw in 5 tomatillos, which gave a great tangy flavor to the soup! I will be making this all summer long, thank you! Omg- I saw this on FG yest and wanted this last night when I was feeling feverish- beautiful color, love it! Yum! So fresh & refreshing looking. 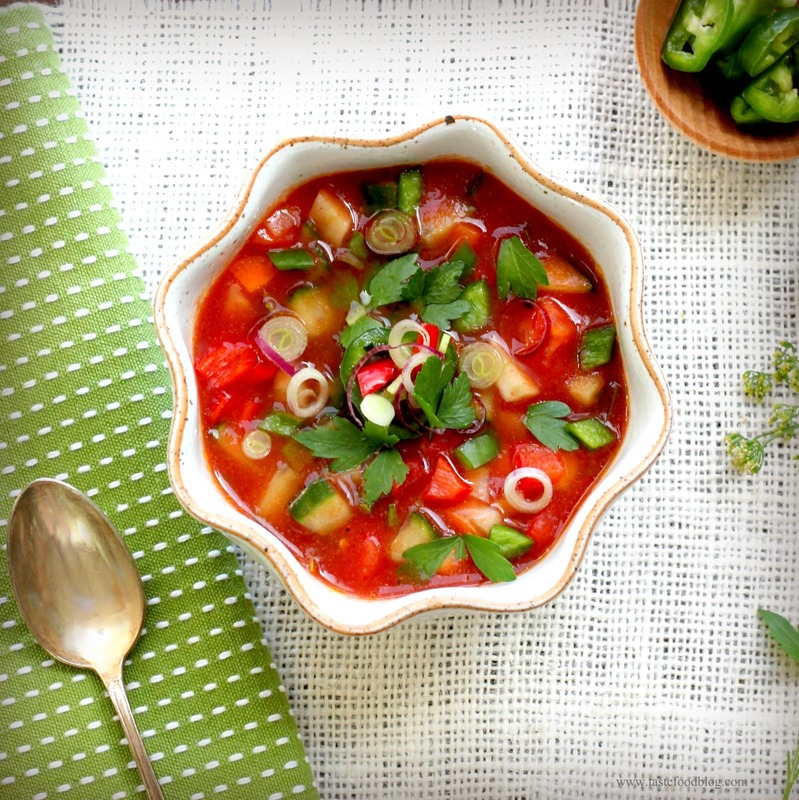 I love gazpacho it’s just perfect for summer! Yours looks very refreshing and I love the chunky veggies. I love Gazpacho and what a great idea to keep it chunky. Lucky for me Hubster won’t touch it!